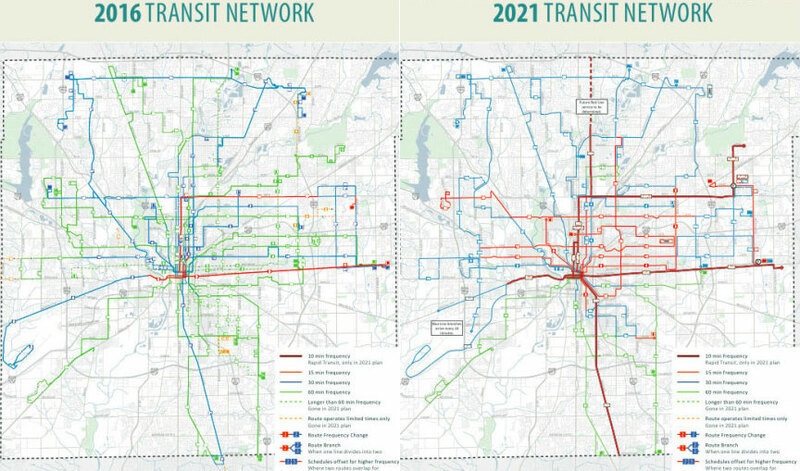 The Indy Connect plan would dramatically expand frequent transit routes (in red). Maps: Indy Connect. Click to enlarge. The presidency and Congress aren’t the only things at stake when voters go to the polls next month. In several cities, people will also be deciding the future of their transit and transportation systems. With the odds of increasing federal transit funding looking remote in gridlocked Washington, these local ballot measures take on even more importance. Before the election, Streetsblog will be looking at what’s at stake in some of the big transit ballot initiatives, starting with Indianapolis. Indianapolis is a growing city, but the region’s bare-bones transit system is not keeping up. Bus routes that provide service at least every 15 minutes are almost non-existent. Only about 2 percent of the city’s commuters take transit to work, compared to 8 percent in Cincinnati and 18 percent in Pittsburgh. Voters will have a chance to change that in November when they decide on a major expansion of the region’s transit system, funded by a .25 percent income tax hike. If it passes, the Indy region will dramatically expand frequent bus routes, extend service hours, and build three bus rapid transit lines. Kevin Kastner, who writes at Urban Indy, says right now the bus system does not provide service that people want to use. Indy Connect, the plan for regional transit developed over a six-year public process, would put frequent bus service within a half-mile walk of 65 percent of all Marion County residents and 85 percent of county residents who live in poverty. The campaign is spearheaded by the Indianapolis Chamber of Commerce, which supports the measure as a means both to improve job access for people with low incomes and to help attract and retain young skilled workers. Also backing the transit measure is a broad coalition of non-profit and community groups. There is an organized opposition effort, but it does not appear to hold much sway. Polls indicate the measure will pass handily, though Mayor Joe Hogsett has refrained from endorsing it himself. A highlight of the plan is the Red Line BRT project, which will beef up service on the region’s most important transit corridor, connecting some of the most densely-populated low-income areas of the city to jobs. The 35-mile route serves the region’s two largest employment centers: downtown Indianapolis and a highway node in Carmel, Indiana. It also reaches the biggest hospital in the state and four colleges. Plans call for the Red Line to operate with 10-minute headways 14 hours a day, and 20-minute headways during early morning and late night service, seven days a week. The heart of the route will have center-running dedicated bus lanes and elevated stations in the median to speed up boarding. The city recently received $75 million in federal grants for the project. Officials say that the federal funding will enable the 13-mile first phase of the Red Line to proceed regardless of whether referendum passes, but funding from the referendum is needed for a full build-out. Correction: The original article said BRT would be free to ride. Riders will pay regular fares. The BRT lines will have the same fare as regular routes. They will definitely not be free. Fare will be collected before boarding at the station.